PSV Eindhoven have pulled out of talks to sign Newcastle forward Albert Luque on loan until the end of the season. 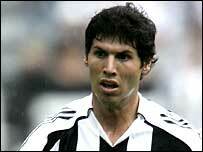 Luque was keen on the switch to Holland, according to the 28-year-old Newcastle outcast's representative. But it is understood Newcastle were not keen to release the Spanish star for the second half of the season, despite his struggle to settle on Tyneside. PSV technical director Stan Valckx told De Telegraaf newspaper: "In principle, we can forget that." The former Deportivo La Coruna player has struggled since joining the Magpies for £9.5m in 2005, and wants a move to resurrect his career. Luque has struggled to make even the bench this season at Newcastle despite a return to full fitness and the Magpies having major injury problems.